We are less than a week away from the start of the NCAA Men’s Basketball Tournament. “Selection Sunday” starting on March 17th. The First Round starts on March 21st. However, the first 4 teams square off on March 19th and 20th, ushering in what I consider the official start to March Madness. The NCAA Tournament is one of those sporting events you can catch without paying a dime for cable or satellite TV. Nearly every game of the tournament is available through streaming or a TV antenna. This year’s games will be aired on 4 different networks, CBS, TBS, TNT, and TruTV. At first, this may make you recoil but fear not. All these channels are available in most areas on a few streaming services. TBS, TNT and TruTV are available on many services, but CBS may or may not be available based on your location and the streaming service you choose. FuboTV is one of my favorites among Streaming services because it’s a startup specifically geared toward cord cutters. They offer TBS, TNT, TruTV nationwide and CBS is most local markets. You can check here to see which channels are available in your zip code. If you aren’t in or close to one of these markets, you can still stream TBS, TNT, and TruTV while using a TV antenna to catch your local CBS broadcast. You can also check out our full review of FuboTV for more details. Hulu Live TV offers CBS is most markets in the country. They also provide TBS, TNT, and TruTV. To see if Hulu Live TV offers CBS in your area, you can use this tool: Hulu Live TV Channels by Zipcode. If you aren’t in or close to one of these markets, you can still stream TBS, TNT, and TruTV while using a TV antenna to catch your local CBS broadcast. Also be sure to check out our full review of Hulu Live TV. Hulu offers a 1-week Free Trial, after that it costs $44.99 per month. While Hulu is a great option cord cutters to watch March Madness there are some other options to try. PlayStation Vue – PS VUE also starts at $45 per month. It also offers all the cable TV channels you need with CBS being available in specific markets. They offer a 1-week free trial. Check out our review of PlayStation Vue for more information. Sling TV and CBS All Access – Sling TV provides access to TBS, TNT, and TruTV. Live TBS and TNT is available through the base package, while TruTV is accessible through their “Lifestyle Package” for an additional $5 per month. The best think about the service is there is no contract, so you can drop it at any time. You can get their service free for 1-week. Since Sling TV doesn’t offer CBS, you can still catch those games with CBS All Access or by using a TV Antenna. YouTube TV – This service from Google provides access to your local CBS, TBS, TNT, and TruTV for $49.99 per month. However, CBS isn’t available in all parts of the country. Check out my review of YouTube TV for information on availability. DirecTV Now – DTV provides live access to TBS, TNT, and TruTV but they also provide live access to your local CBS affiliate in many parts of the country. You will find all these channels on their “Plus” package for $50 per month. Be sure to check out our full review of DIRECTV NOW for more information. The NCAA Men’s Basketball Tournament last three weeks, with the First Round of the starting on March 19th and wrapping up with the National Championship game on Monday, April 8th. This means you can take advantage of 1-week free trials from three of the services I mentioned above and watch the whole tournament for free. Just be sure to cancel each service before your free trial ends. The NCAA does offer an app available on iOS, Android, Apple TV, Amazon Fire TVs, and Roku. However, the app requires a TV provider login. The app does accept streaming services as a valid provider, but there is a major drawback. The March Madness Live app won’t stream games airing on CBS live if you are using a TV connected device like Roku, Apple TV, Fire TV, etc. Consider the finals are on CBS, this is a major deal breaker for cord cutters. I recommend just watching through your streaming service. You can download the app below on various platforms. 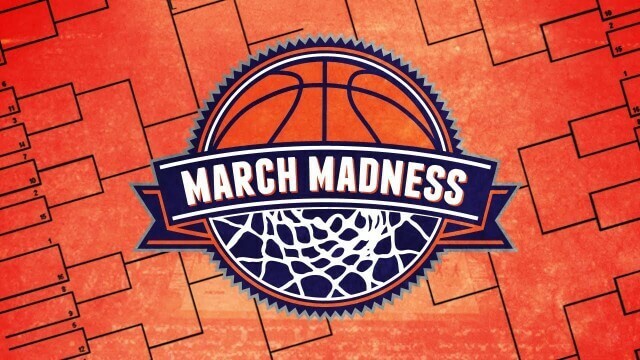 Thursday, March 28rd kicks off the Sweet Sixteen and plays into Friday, March 29th with games airing on CBS and TBS. The Elite Eight start playing the next day on Saturday the 30th. They continue to play on Sunday, March 31st. Those games will air on TBS and CBS. The Final Four is played on Saturday, April 6th at 6 pm and 8:30 pm ET. The games will air on CBS.